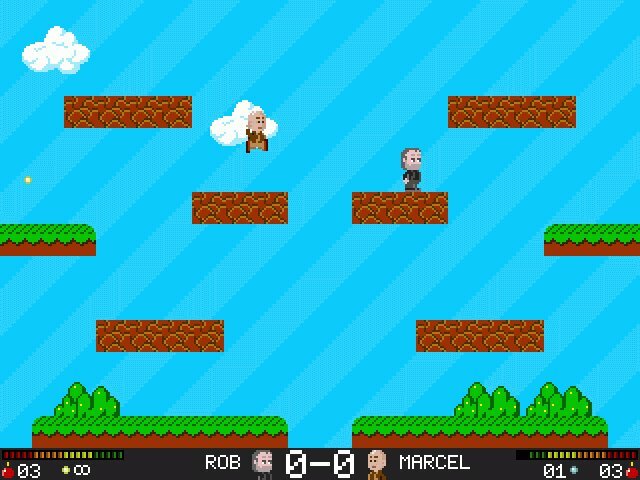 Smash Battle is a cross platform, 8-bit style game where two, three or four player face off against each other. The game was inspired by the mario battle minigame from mario 3 when we started developing, but changed a lot over time. Date: 2009-09-08 15:06:23 User: DemonTPx Subject: Awesome multiplayer shooting fun! You'll need some gamepads for this game, but if you have them, this game will be awesome! The more friends you play with (max 4), the more fun it gets. Date: 2009-09-08 15:09:16 User: inspector Subject: Lot's of fun to play in multiplayer! We recently started to play this game at work. Most of the time we played the 4 player death match witch turns out to be a hell of a laugh! I've spent many hours with this game and still play it often. Since it's still under development a single player mode will come out soon. I would recommend to check http://smashbattle.condor.tv for updates about this game. This is really one of those family / friends type game . . no single player action (yet?) but an awefull lot of fun to play with one or more friends. TAKE A LOOK HERE! http://www.haikuware.com/directory/view-details/games/classics/smash-battle THANKS FOR THIS AMAZING GAME!!! No we don't. Looked it up though but couldn't find any resemblance. Smash Battle was inspired by Super Mario Bros Battle but has come a long way and found its own type of gameplay and graphics. Hope you enjoy it!